Books recently read for school: Pride and Prejudice; Hamlet; The Iliad. Books in your to-read pile: The Girl Who Played With Fire; The Girl Who Kicked the Hornet's Nest; The Help; A Gate at the Stairs. Favorite Authors: I still don't have any 'favorite' authors. There aren't any that I am madly in love with, and whose works I enjoy without exception. Favorite books: Leaves of Grass, The Alchemist, Brave New World, The Hobbit, Extremely Loud and Incredibly Close. Why do you like to read? : Reading provides an escape. I don't feel anything that doesn't have to do with the story. I never stray from the plot line in my needs and emotions. It is all-encapsulating. A great book will make the sky dark and my eyes weary. It will release me with one final period as if I suddenly woke from an amazing dream. Favorite musicians/singers/types of music: Yellow Ostrich; Freelance Whales; Foster the People; The Hush Sound; The Script; Local Natives; Avi Buffalo; Young the Giant; Fleet Foxes; The Morning Benders. Do you listen to music (or TV) while you read? : No, it detracts from the reading experience. Do you finish every book you start? : Almost always. If it's a recommendation, I might try the first few pages and if I don't like the writing style then I will stop. Other notes: I got a Kindle Touch and I don't miss feeling paper under my hands when I read. I recommend them. I'm sure most, if not all, of us have done something with good intentions, only to see things turn out...not how we expected. That's not what happened after the Eighteenth Amendment went into effect. There were some positive outcomes; fewer people were arrested for drunkenness or died of alcohol-related diseases. But millions more willfully broke the law, smuggling alcohol into the United States or brewing it themselves. Policemen and politicians accepted bribes while gangsters fought for bigger shares of the suddenly-illegal alcohol distribution trade. In Bootleg: Murder, Moonshine, and the Lawless Years of Prohibition, Karen Blumenthal delves into the history of Prohibition, its causes, and its effects. 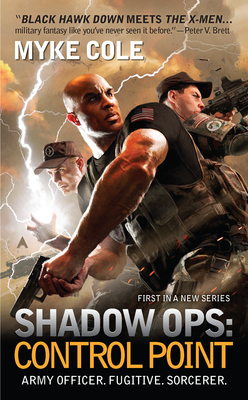 This makes the book's title somewhat misleading, since the scope of Blumenthal's narrative is broader than just bootlegging and gangs. So don't be surprised when the book begins with an account of the St. Valentine's Day Massacre in 1929, but doesn't return to the incident for another eight chapters. 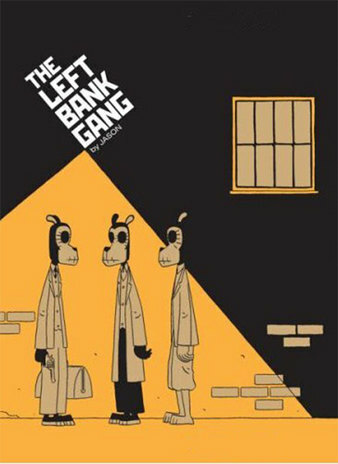 The Left Bank Gang opens with a dog shuffling down the streets of 1920's Paris, keeping mostly to himself. He ignores a panhandler, but then sees another dog that he recognizes. They shake hands. One dog's name is Ezra Pound. The other's is Ernest Hemingway. Gang is a clever nugget of alternate history fiction. Rather than focusing on complex geopolitical questions like "What if the Germans won World War II?" Norwegian cartoonist Jason turns to the zeitgeist of expatriate writers such as Pound, Fitzgerald, Joyce, and Hemingway. His hypothesis is "What if all of these starving geniuses just got fed up and turned to crime?" Each literary celebrity is drawn as an anthropomorphic animal. That stylistic choice is a staple of most of Jason's work, and adds to the accessibility of his comics. Most are dogs, though James Joyce is a bespectacled bird. The scheme is appropriately Ernest's. You don't run with the bulls of Pamplona without having keeping a few other crazy ideas stored away. F. Scott Fitzgerald is happy to tag along. His wife Zelda is dissatisfied with Paris and the homesickness is starting to spread to him. Starting middle school is difficult for any kid, but for fifth graders Shuichi and Yoshino, it's made even more difficult by the secret they share. Shuichi is a boy who wants to be a girl and Yoshino is a girl who wants to be a boy. 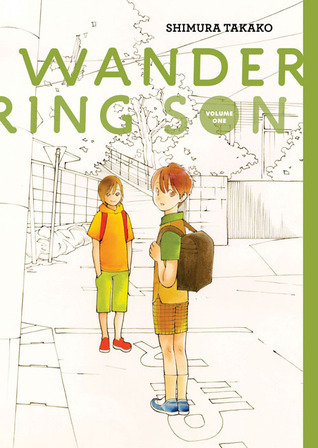 Shimura Takako has created a manga that tells, in simply beautiful graphics a story that is anything but simple. In volume one of the series, we follow Shuichi and Yoshino as they begin to share their secret, first with each other and then with a classmate. In volume two, we follow the kids up to sixth grade. Shuichi's sister learns of his desires and Shuichi and Yoshino find a mentor in a transgender woman who takes the kids under her wing. This basic plot description doesn't really do justice to this amazing series. To date, I have not come across any books that depict transgender youth so young, and I think this is one of the great strengths of the series because it allows the reader to focus more closely on the issue of gender identity as opposed to sexuality when so often these are mixed together. And of course, gender identity and sexuality inform and influence each other, but it's worth noting that they are not the same thing (at least, not from a queer theory critical view, something I've been studying here in graduate school land). The stories are sparse. This isn't an action-packed manga, but I find the simplicity all the more powerful as it allows me to really contemplate the characters' lives. And even though the kids are struggling with their gender identity, this isn't an angsty drama. Well, it's not too angsty. Let's try an exercise. Put down your books just for a second. Just set them down there next to you. They're not going anywhere. They'll be there when you get back. You don't even have to stop reading to participate here. Ok? Breathe. Now sit down at your computer and get on line. Oh, wait, you're already there . So you're familiar already with reading online since you are, uh, doing it right now. Ok, good. I'm going to suggest that you do a little more online reading. Because there's some good stuff--really good stuff--you may be missing. It's the stuff collected by the news aggregator sites longform.org and longreads.com. What is it like to be a college football player? Or how about being hired to coach in one of the most pressure filled programs in the country? Enter John U. Bacon's Three and Out: Rich Rodriguez and the Michigan Wolverines in the Crucible of College Football. Bacon, a reporter based in Ann Arbor where the University of Michigan resides, was given incredible access for the whole three year reign of head coach Rich Rodriguez. Rich Rod, as he is known, became the Wolverines head coach in 2008 leaving the West Virginia team that he had built into a top tier program. The hiring was incredibly controversial, especially because Rich Rod didn't have any ties to U of M at all. Instead of recounting more of the story, as fascinating as it is, I'll highlight a couple things that I learned about college football. According to Bacon, the relationship between university presidents and the football coach can be incredibly strained. Universities need football programs for the great amounts of money they generate, but head coaches can become legends and bigger than the university itself. This power makes many university presidents nervous and is why Rodriguez's tenure at WVU became strained and he even considered taking the job at Michigan. Another interesting part of this story is the rise of U of M quarterback Denard Robinson. Being a student athlete is a rewarding yet tough situation that involves hours and hours of practice and travel along with the already busy schedule of being a student. While many are at the school on scholarship the players can't be paid in any way. So as Robinson became one of the nation's most exciting players, the school, the NCAA, the Big Ten and many others make millions of dollars on jerseys, tickets, products, advertising and more. Robinson, meanwhile, receives nothing and is put in the sometimes uncomfortable position of being the most famous person on campus. There are many other things that Bacon brings to light including the politics of being a coach, recruiting high school athletes and the strange, illogical rules of the NCAA. Three and Out is a great way to learn more about a lot of the inner workings of college football. There are a couple of flaws to the book, the most obvious being a possible bias since Bacon seems to really love the university and became quite fond of Coach Rodriguez. Still, he really delves into what goes into running a football program and the pressure of living up to a storied history like the Wolverines have. This is up there with my two favorite football books that I would also recommend. Friday Night Lights by Buzz Bissinger chronicles a Texas high school team (and spawned a great movie and television series) and John Feinstein was allowed to follow the Baltimore Ravens for a year in a book called, Next Man Up: A Year Behind The Lines in Today's NFL. For more info on college football, student athletes and some of these debates, The Atlantic did a great article called The Shame of College Sports. This isn't Harry Potter magic, my dear muggle. It's fast-paced military action complete with helicopters, armored vehicles, guns, soldiers, and, oh yeah: sorcerers flying around with flames shooting from their hands and creating armies of flaming elementals and dead goblins to help fight their battles. Anyway, I'm shelving Beastly, that book by Alex Flinn that was made into a movie, when I come across an old favorite of mine by an author also named Alex Flinn. Here's the kind of idiot I am: it doesn't occur to me that these are the same author. Instead, I end up asking, "wow, what a great book this was..." And that was the end of my alphabetizing - the afternoon was stolen by Breathing Underwater. Reading the right book at the right time can change somebody's life. The internet plays host to a wonderful, mad tangle of conversations about books. People talk endlessly about what books are popular, what books should be more popular, paper books vs. ebooks, and on and on. But something tends to get lost in the mix: why are books so important in the first place? How do they make a difference in our lives? Exactly what is the magic of words on a page that can alter our perspective, give us the courage to try something new, or just get us through a rough patch? To explore how books make our lives better--and make us better at life--I’ve started a new website, Books Love You, where people can share stories about books that changed them. The site is tiny right now, but I do have a few stories up (including one by Guy Lit Wire's own Colleen Mondor.) Hopefully, as the collection of stories grows, people will be able to search for books by title, genre, even the different ways they've helped people such as heartbreak or illness. But of course, a site like this thrives on reader participation. If you guys could help spread the word, I'd be incredibly grateful. And if a book (or poem or short story or graphic novel) has ever made a difference in your life, I'd love to hear about it. First, a few disclaimers. I've met John Green. I like John Green. I've been a Nerdfighter since pretty much birth the term first arose on the vlog John and his brother Hank started in 2007, before it went viral and they became internationally known YouTube superstars. So, well, y'know - don't expect a completely unbiased review from me, is what I'm saying. The Fault in Our Stars tells the story of terminally ill Hazel, who meets a hot boy named Augustus Waters at the Support Group her parents force her to attend. Hazel and Augustus hit it off, and romance follows, even though Hazel tries hard to fend it off, believing that it's better not to form attachments, since she knows she's going to die, and she knows that the people she leaves behind will be hurt when she does, and, well, she doesn't want to be responsible for hurting more people than is absolutely necessary (and even then, as is the case with her parents, she wishes those people didn't have to be hurt). Hazel tells Augustus about her favorite (fictional) book, An Imperial Affliction by Peter Van Houten, a literary sort of book that accurately describes what it's like to be a teen dying of cancer, and which ends mid-sentence as the main character dies or loses the strength to continue. Both Hazel and Augustus end up loving the book, and chasing down the reclusive author to try to find answers to Hazel's questions about what happened to some of the other characters in the book. Hazel is especially concerned about the main character's mother, wanting a happy ending for that mother. Without it ever being stated, it's entirely clear that Hazel is particularly worried about what will become of her own mother once Hazel dies, since her mother's entire life pretty much revolves around caring for Hazel - it's her mother's full-time job, pretty much, and as an only child, Hazel worries that once she's gone, her mother will be left with nothing. 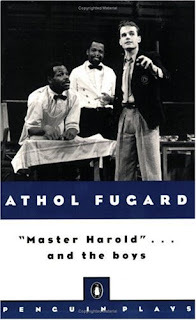 The career of South African playwright Athol Fugard has been inextricably linked with the history of Apartheid. A vocal opponent of the system, he was subjected to government surveillance and suppression of his plays while writing for and organizing multiracial casts. Drawing inspiration from traditions spanning Brecht to vaudeville, his works focused on representing the effects of Apartheid on social and personal interrelations. In his 1982 play Master Harold…and the Boys, Fugard plays out the effects of Apartheid on a personal level. Set in 1950, in a small tea room, Harold, called Hally, a teenaged white South African, waits out a rainy afternoon with his family’s two black servants, Willie and Sam. Waiting to hear from his mother, who has gone to see his father in the hospital, Hally’s conversations with the men range from school, to the ballroom dance, to reminiscence of his childhood with them. In their interaction, it becomes clear that Sam has filled a fatherly role for Hally, of which the boy’s own father’s drunkenness and instability deprived him. The humans aboard the Battlestar Galactica (from the newer series, not the original) have a problem. They're being hunted by robots, or, in the show's terminology, "cylons." Some of the cylons look like regular robots: they're made of shiny metal and their limbs are driven by pistons and they say things like "BY YOUR COMMAND" with obnoxious computerized voices. They're fast and powerful and hard to destroy, but at least their human victims know what they're up against. Some cylons, though, look and act just like humans. The human-looking cylons are far more dangerous as the Battlestar Galactica humans never really know if they're talking to one, or, for that matter, dating one. If I had to guess who was the most well-known author of manga, I'd go with Osamu Tezuka, perhaps best known as the author of Astro Boy and effectively progenitor of the vast majority of manga available today. His popularity, prolific output, and long career is arguably a major contributor to the large and diverse manga market in Japan. 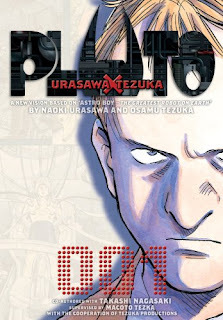 So it's understandable that, for the "birthday" of Astro Boy (Tetsuwan Atom) in 2003, Tezuka Productions would work with a contemporary well-known author—Naoki Urasawa—to produce a commemorative manga themed around Astro Boy. This is where Pluto comes from: based on a short story by Tezuka, Urasawa and his editor Takashi Nagasaki take the concepts that Tezuka presented in Astro Boy and refashions them into a stand-alone but decidedly more Urasawa-esque narrative. This translates to a darker, more sophisticated take on a world with robots, and plenty of exploration into the concept of artificial intelligence, what it means to be "human-like", and the disastrous consequences that can follow as a result. "Justin has two goals for sophomore year: to date Chuck, the hottest boy in school, and to become the king of Cool U, the table in the cafeteria where the "in" crowd sits. OK so I really need to read summaries before starting a book because I had no idea this was a gay novel until I started reading it. No joke, I re-read the first page just to be sure that it was a male narrator commenting on wanting a boyfriend. This of course made me really want to read the novel even more so than before. 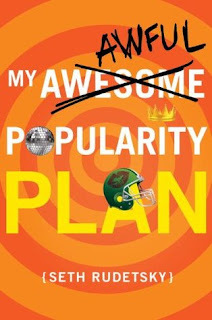 Anyway, this is the kind of book I'd like to write- a hilarious, sarcastic, compelling book about a gay protagonist navigating through high school. I was so happy to see so much humor in the book (pretty much a laugh a page, if not more) because while I love all the gay teen books I've read, there aren't that many that are also hilarious. I loved how Rudetsky wrote Justin and Spencer's friendship- it felt realistic, and it was nice to see two gay guys just being friends. Reading about their friendship and inside jokes and rituals was really fun and kept the pages turning. What also kept me compelled was the whole comedy of errors going on as Justin went through fake-dating Becky to try real-dating Chuck. Overall, a fantastic YA debut and I really hope Rudetsky writes more! Here’s a secret that’s totally not a secret: I’m a Shakespeare dork. I suppose this makes sense, when you consider that my undergraduate degree is in drama. (Although I certainly knew classmates who didn’t like his work—even in the advanced Shakespeare class I took.) I also have a deep fondness (in fiction, at least), for what a friend of mine once described as “twee postmodern crap.” So it’s really not the least bit surprising that I would go for The Tragedy of Arthur by Arthur Phillips. I’ve been intending to get to Phillips’ work for quite some time now—I picked up his first three novels, Prague, The Egyptologist, and Angelica, long ago, but this one is the first one that I’ve read. The conceit of The Tragedy of Arthur (the book) is this: officially, it’s a rediscovered Shakespearean tragedy about King Arthur with an introduction by notable novelist Arthur Phillips. It is also, in the form of this introduction, the story of Arthur’s relationship with his father, a counterfeiter whom he believes forged The Tragedy of Arthur (the play). 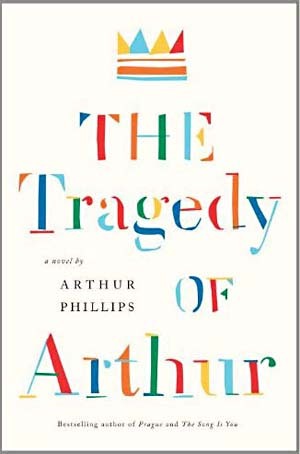 The introduction runs more than 250 pages, in which Arthur Phillips (the character), while fulfilling the terms of his contract with Random House to synopsize and annotate the play, gives the reader a history of his life with his father (brilliant, troubled, jealous of his ex-wife’s new husband) and his sister (brilliant, talented, obsessed with Shakespeare in a way that Arthur is not). It’s then followed by the play (itself about 100 pages long), with copious notes of the sort you’re likely to find in your average copy of King Lear or Much Ado About Nothing—explications of archaic vocabulary, occasional dramaturgical commentary—plus some notes by Phillips detailing the places where he believes his father’s game is given away.